It’s not ready to go into production yet, but all the signs are that it will. For now, it’s a tantalising glimpse of what will probably be! 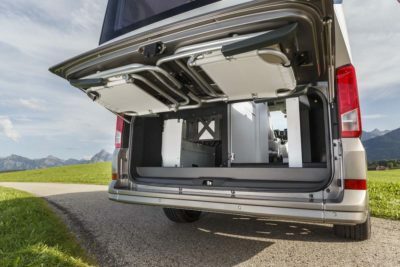 From Volkswagen, it’s called the California XXL, it’s based on the Transporter’s bigger base vehicle sister, the Crafter, and it oozes class, quality and practicality in equal measures. 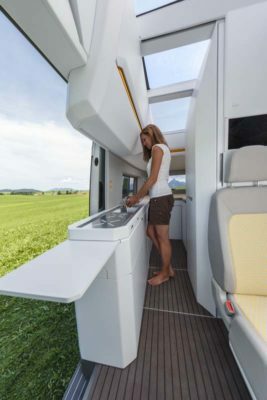 Making its world debut at Caravan Salon in Dusseldorf, Germany – this was the undoubted star of Europe’s largest motorhome event – which augurs well for concept becoming reality. 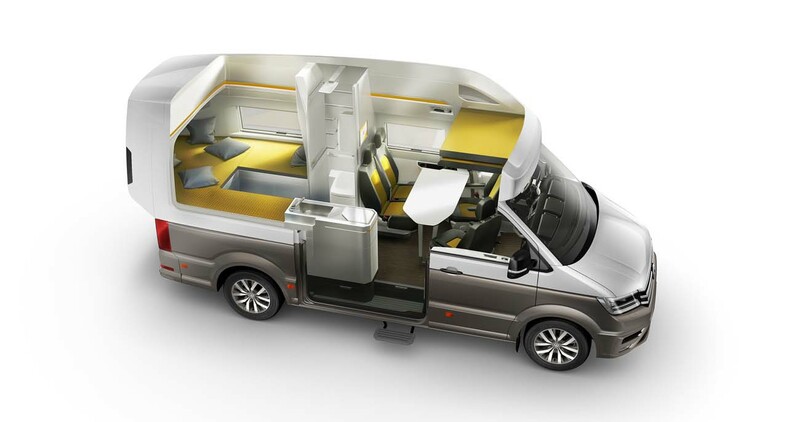 There’s plenty “under the skin”, but the most striking feature of the California XXL is its purpose-made roof design. 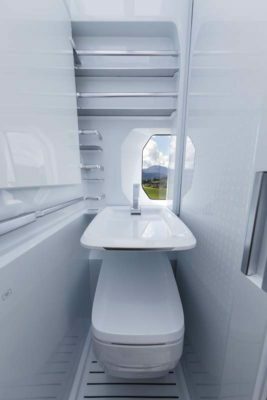 Not only does it add extra overall height, it means standing room inside is a spacious 2.20m. And its windowed, allowing lots of daylight in, as needed. Blinds and strip lighting are there for night-time use, too. The roof moulding goes on to provide a rear extension section – it takes the vehicle length from the 5.99m of the initial medium-wheelbase Crafter to 6.24m – also house flaps for access to the water filler, gas point, mains hook-up etc. But again, it’s all about optimising the internal space, this time for a large double bed at the back. Sleeping is for the family, too, thanks to some innovative bedmaking. 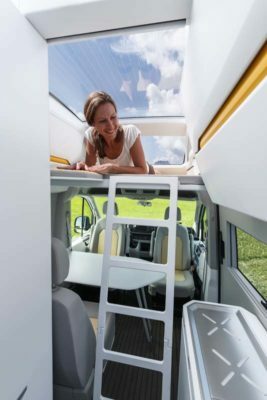 Adding a couple of drop-in panels to the rear seating creates a double bed some 2.00m x 1.70m, complete with its own heating and cooling function, while a short hop up a ladder will take you to upstairs accommodation. Here, again there’s been some clever thinking. Although the suggestion is this is primarily for small children, there’s an additional stretch of mattress that goes up to 2m, for one lucky person. Back downstairs and the kitchen stays with the original California’s camper roots. 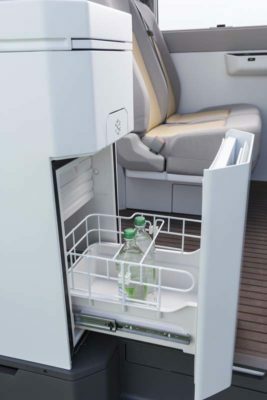 There’s just a two-ring hob for cooking – with burners that lower to fit flush to the aluminium top when not in use – but there are two 50-litre fridges, one with a four-litre freezer. 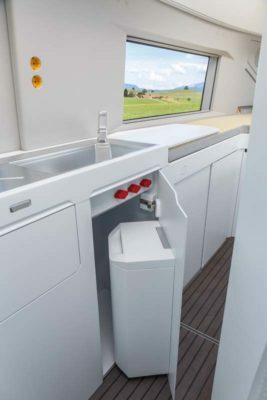 Plus, there are a couple of clever worktop extensions and a removable chopping board, with travel storage slot on the fridge door. There are also drawers for cutlery and crockery, plus a waste bin and magnetic spice rack. There’s also the bonus of nine 230V sockets and six USB points throughout the living quarters. It’s the first California to boast a washroom, too. 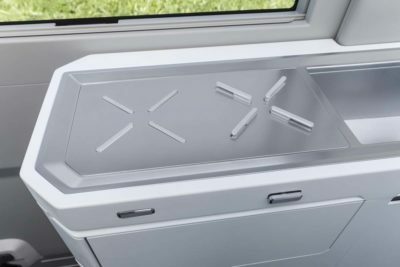 Again, there’s some clever thinking here, with a pull-out section to boost space when needed and a fold-up sink. Throughout, there’s top quality moulded furniture in easy-to-clean plastic – not a hint of the “wood and carpet” approach used by traditional converters. Other equipment extends to a heating system for flooring that’s already warm to the touch thanks to its cork finish, two reversing cameras, a shoe drawer, gas tank, signature California outdoor chairs and so much more. All-wheel drive and pneumatic suspension are also offered. Many features can be operated remotely via an app, for instance – lighting, entertainment etc, all the way through to opening the washroom rooflight. VW has told us there will also definitely be a solution to carry a bike and here’s what it could look like. 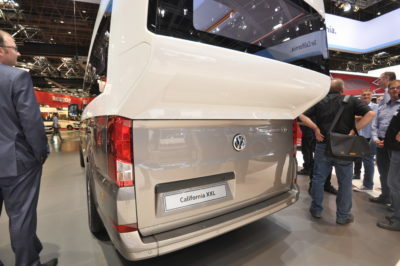 It seems the biggest headache for Volkswagen at present is where to build the California XXL. Its exclusive California factory in Hanover is already at capacity and not suited to the larger Crafter base vehicle anyway, it says. 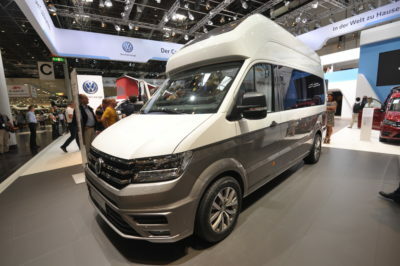 At the moment, the smart money seems to be on adding a campervan area near the factory in Poland where the Crafter is produced. It makes sense… as does so much about this all-new high-top concept. 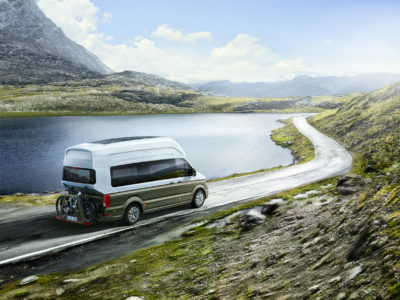 There’s more information on the California XXL on the Volkswagen website www.volkswagen-vans.co.uk. Find out more about insuring this or your current campervan or motorhome on our motorhome insurance discounts page or our campervan insurance page. I don’t share the uniquely British obsession with ovens, though I do understand it. Finding decent good-value food is still more difficult here than elsewhere in Europe. But ovens have to be cleaned. Two rings would be fine. But would I fit in a small harp and secure travel for two large dogs? And how well-insulated would it be with that roof? Overheating is more of an issue for me than cold – bad for both harps and dogs. there is a surcharge on ferry travel for lengths greater than 6m, the washroom needs a shower, should avoid French automated tolls at less than 3m which makes it class 3, where go the bikes? There is a shower in the wet/wash room. We’ll find out about the bikes from VW. Hi, VW have told us there will definitely be a solution to carry a bike. We’ve added a photo of what this could look like in the article. 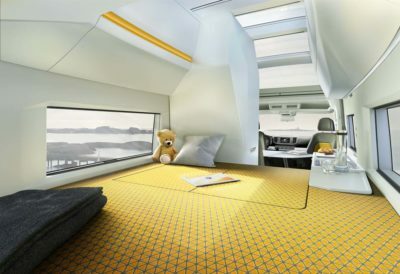 Hardly a camper at over 6 metres long, its based on a commercial van and not comparable to the T6 California or other people-carrier based campers. More choice in the 6 metre plus category from the likes of Auto Trail, Hymer and loads bespoke British converters. It’s clearly getting a mixed response Frank! Looks a step up from previous models. However such luxury with only a double ring cooker, no oven, no micro wave, but large fridge space. Weird thinking going on here! If ya not gonna cook what goes in all that fridge space? Equally the washroom seems an add on with very little room to use comfortably, again another weird feature. So not for me! It’s just a concept at this stage Dave, so some of these details might change based on feedback. Wow,space space and more space,looks great to me. Outside function over form but still American stylish. 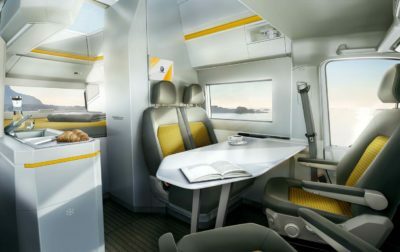 Inside clean, efficient and looks really functional. Typical VW solid looking build for longevity. I expect the price will put it in my dream category. 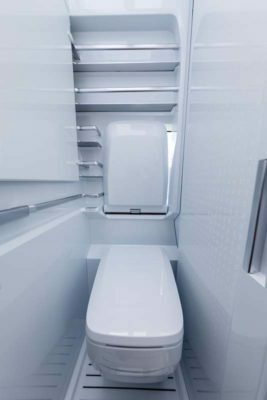 Love Camper Vans but like many have always been put off by having a loo that pulls out into the main area of the van. This looks great and gets my vote. Probably very expensive but then quality in anything always is. Love to own one. same as others outside ugly but inside great and with a loo. The only reason I’ve never brought one is because they didn’t have loos. Inside, very lovely! Outside … Yearch! VERY UGLY!